“The fundamental question we must ask our universities is: ‘How will you preserve and uphold the rights and freedoms of students and faculty to speech and thought this Duty directly targets and diminishes?’”, said Dr Mezna Qato, a junior research fellow at King’s. Earlier this week, students at the University of Reading were advised to take care when reading an essay entitled ‘Our Morals: The Ethics of Revolution’ written by left-wing academic Professor Norman Geras, because it has been marked as ‘sensitive’ under the government’s Prevent legislation, a series of counterrorism measures introduced in 2015. Varsity spoke to several academics on their reactions to the University’s decision to warn third-year students against reading the essay on their personal devices or to leave the essay lying around, in case they were flagged up under Prevent. Dr Waseem Yaqoob, a lecturer in the history of modern political thought at Pembroke, called it “depressingly predictable” that left-wing thought would be one of the next targets, suggesting that universities are “beginning to cast their net wider”. He went on to say that while the University of Cambridge has promised a “light touch” approach to Prevent, its “implementation has often been wrapped up with welfare or safeguarding duties” and is further complicated by the collegiate system, as he claimed it is “not clear” that “this stance has been adopted by colleges”. Yaqoob said that this has led to a “high degree of self-censorship” by Muslim students, which he stated was deplorable. 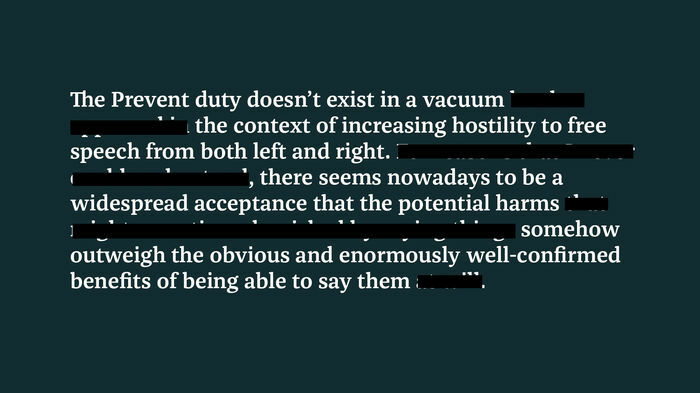 An investigation earlier this year found the rollout of the Prevent policy in 2016 across Cambridge colleges characterised by inconsistencies and a lack of accountability. Several Muslim students also spoke to Varsity that they ‘self-censored’, which one student said was born out of “fear of being called extreme”. Benjamin Abrams, Affiliated Lecturer in Sociology with research interests in revolutions, told Varsity that he was surprised that the essay was flagged as it was “very far from a radical call to arms”, especially when compared with the “more well known revolutionary figures in the Jacobin or Bolshevik traditions” who are prominent on history and politics programmes across the UK. He further expressed concern over the authority university staff has in the Prevent programme, as university staff do not have “the same training and expertise as civil service counter-terrorism and counter-radicalisation specialists”, they are “occasionally liable” to misjudge cases on the side of “extreme caution”, such as this case at the University of Reading. “The notion that someone could read Geras's article and thereby become a future national security threat belies a fundamental misunderstanding of how violent radicalisation occurs”, he added. A University of Reading spokesperson told Varsity that the Prevent policy is “designed to uphold freedom of speech, encourage academic freedom and prevent self-censorship”, while safeguarding “staff and students who access security-sensitive materials legitimately and appropriately used for study or research”. Dr. Adam Branch, lecturer in POLIS and course organiser of ‘International Conflict, Order and Justice’ – a required first-year undergraduate lecture class – told Varsity that if Geras’ essay is deemed ‘security-sensitive’, “then so should much of the literature written in support of the American, French, and Russian revolutions”. He elaborated that violence is “a central part of politics” and that he uses texts which justify violence from a range of viewpoints in his class. Branch criticised the premise of such policy as based upon “an assumption that certain ideas will necessarily produce violence”, which he rejects not least because of the “extremely low estimation” this holds for one’s critical capacity, but also the underlying idea that academic material can encourage terrorism. He added that the term ‘terrorism’ itself holds “fundamental uncertainty” which causes great concern when it forms the basis of policy-making while the policy of flagging is couched in the language of "non-violent extremism" leading to "violent extremism." Dr Qato described the development as “chilling”, but was “also to be expected”. She told Varsity that Prevent and its implementation “continues to be a central threat to the purpose and promise of higher education in the UK”, adding that “We must be vigilant in protecting rights according by the Equality and Education Acts”. She told Varsity that as Prevent is rolled out and “built into educational administrations” it will become “more and more difficult to extricate it”, finally stating that “we must act now” as “our very voices are at stake”.